The three South African provinces of Northern, Eastern, and Western Cape are located at Africa’s southernmost tip, surrounded by the South Atlantic and Indian Ocean. The area is renowned for its wine regions, such as Walker Bay, Constantia, Stellenbosch, and Franschhoek. Major cities, including Port Elizabeth and the country’s capital, Cape Town, are located on the coast. Cape Town’s most impressive and interesting sites are the V&A Waterfront, the colorful Bo-Kaap quarter, and the Table Mountain, which towers over the city. 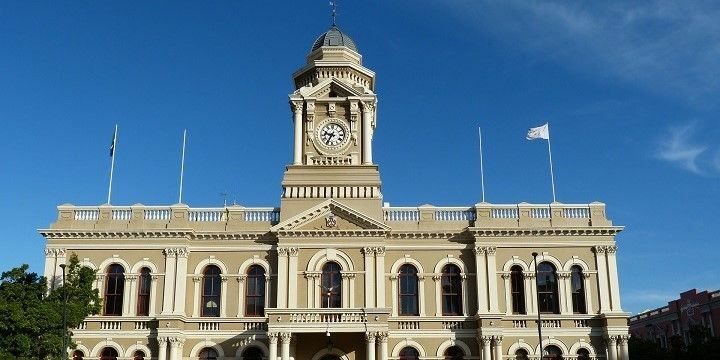 Port Elizabeth is a major city in southern South Africa. Port Elizabeth in the East marks the start of the Sunshine Coast, which hosts endless kilometers of beautiful beaches leading to the town of East London. The warm waves of the Indian Ocean are popular among sailors, swimmers, scuba divers, and surfers. Stay in one of the area’s picturesque villages, such as St. Francis Bay, Port Alfred, or Cape St. Francis, for some relaxing beach days and delicious, fresh seafood. Jeffreys Bay is particularly famous for its mussels, and dedicates an entire festival to them every April! 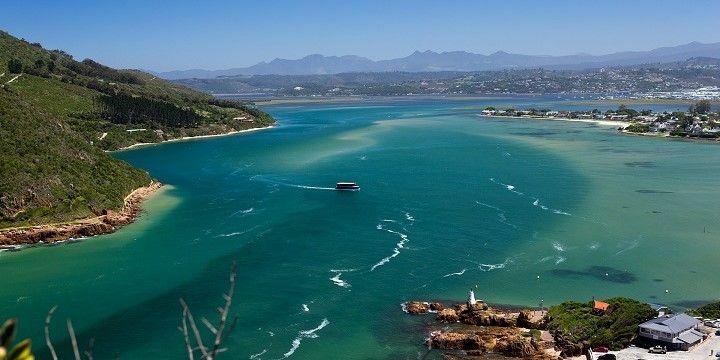 The Garden Route — which stretches from Mossel Bay to Storms River — is a popular road trip, which will take you through some of South Africa’s most scenic regions, and along breathtaking lagoons. Be sure to stop in Wilderness for a canoe trip in the jungle, before heading to Knysna. This laidback beach town is protected by the Knysna Heads. These two huge cliffs are home to the Featherbed Nature Reserve, and offer spectacular views over the Noetzie and Brenton Beaches. Knysna Lagoon is part of the Garden Route. Plettenburg Bay is famous for its seal colony living in the Robberg Nature Reserve. From here, you can often spot whales and dolphins, and sometimes even sharks. Adrenalin junkies shouldn’t miss out on a bungee jump from Bloukrans Bridge, Africa’s highest bridge (216m), close to Nature’s Valley. South Africa is the perfect place to see unique wildlife, including whales. Visit between June and November to see the southern right whale, or between May and December for humpback whales. Bryde’s whales, meanwhile, can be spotted throughout the whole year! Gansbaai, only two hours from Cape Town, is one of the world’s best spots to observe sharks, including great whites. 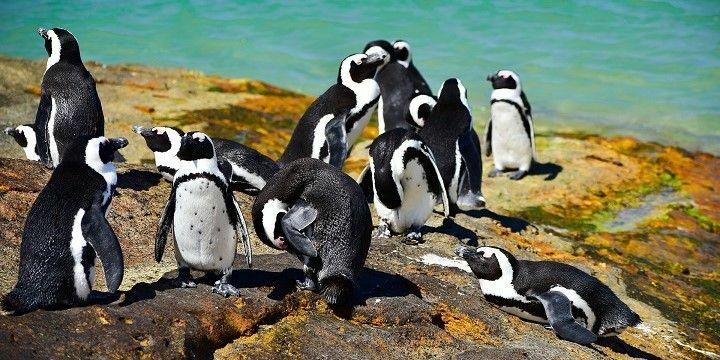 If you take a dip in the sea at Boulder’s Beach on the rocky Cape Peninsula, you might come face to face with some endangered African penguins! The Cape Point Nature Reserve, located at the tip of the peninsula, isn’t only home to deserted beaches and hiking trails, but also unforgettable wildlife, including baboons and dassies. Penguins live on Boulder's Beach. Visit Addo Elephant Park, next to Port Elizabeth, for close encounters with elephants, zebras, cape buffalos, lions, and more. The lesser-known Karoo National Park, meanwhile, is located more inland. Known as the “African Bush”, this semi-deserted park is home to countless species of birds, reptiles, and mammals, such as the red hartebeest, zebras, and kudus. Not many travelers visit the dry and rocky Northern Cape, South Africa’s largest, but least-populated, province. The biggest town the area is Kimberley, also known as the city of diamonds, thanks to its long history of diamond mining. You can still visit the Big Hole, a huge, former diamond mine, today! 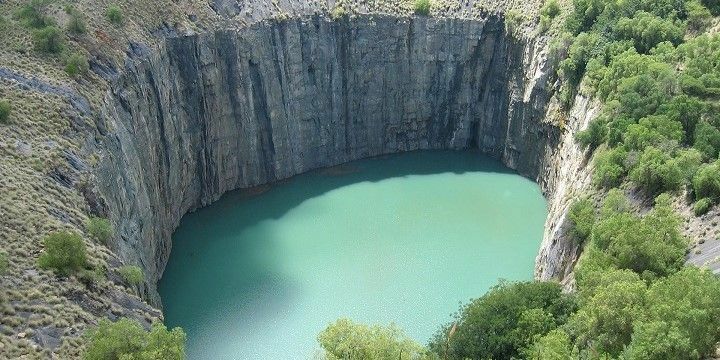 The Big Hole in Kimberley is a former diamond mine. The Kgalagadi Transfontier Park, which also stretches into Botswana, is located in the Kalahari Desert and is famous for its lions. Alternatively, head to Richtersveld National Park, South Africa’s only mountain desert. Be sure to take the once-in-a-lifetime opportunity to raft on the Orange River, while surrounded by the peaceful desert! If NextStop24 helped you to choose your next travel destination, we'd be very grateful if you’d search for your accommodation and things to do in South Africa through these links. They're affiliate links, which means that we will receive a small commission for every booking made through them. There are no extra costs for you; you'll simply be helping to keep NextStop24 running. Thanks! Great for nature lovers, many beaches and outdoor activites.